Water flows downhill, seeking its easiest path. As it flows, the water cuts its way through layers of rocky riverbed. 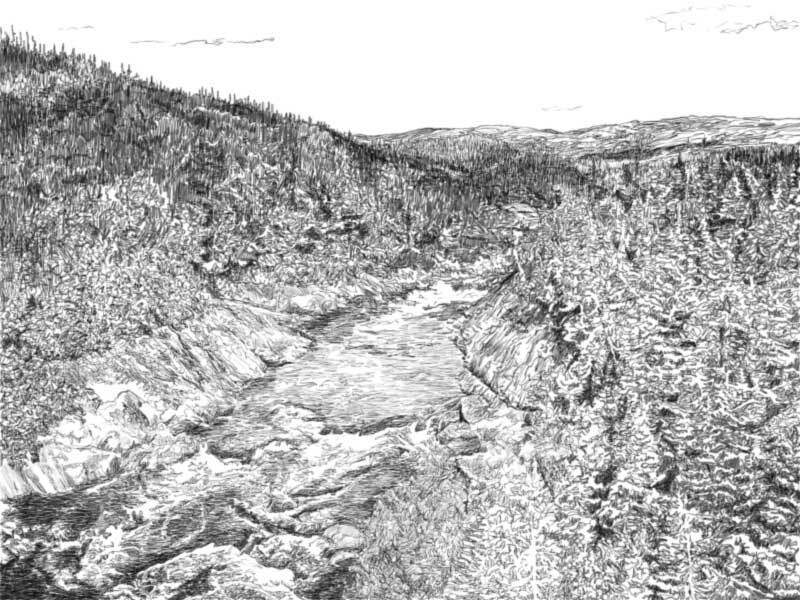 Over time, at this place along the Pinware River in southern Labrador, a break in the rocks has eroded and become a funnel for the full force of the river. This drawing is a value study for a painting I am working on. One of the tricky parts about painting water is that water tends to look like a mirror and not like a solid material. When the surface of the water is uneven, it reflects the texture of the surroundings to a viewer in unexpected ways. An artist has to take into account depicting the texture of the trees, rocks, clouds, as well as the reflections off the water. This drawing is a study in putting the lights and darks in their appropriate places to show these textures and surfaces. Wow, your drawing is awesome! Hi Tracey: Thanks for checking my blog post, I am happy to show you the way this painting will grow through November. Hi Jennibelle: I hope that you will continue to enjoying the drawings I post this month. Hi Missy: I am so pleased that you dropped by to see this drawing! Please come back to see more Art Every Day Month posts.